All rooms have certain things in common – walls, windows, doors, furniture. But the exact size and configuration of your living room or TV room is unique. So finding the best TV mounts for your space requires thinking about your specific situation and your viewing preferences. It helps to know that SANUS has your back here. We offer multiple types of mounting options for TVs, not to mention other electronic components and related accessories. But your TV is the focal point, so you want to start there. Let’s look at the various features and benefits that are available, so you can compare them to find the best TV mounts for your space. Improves visibility for people who are seated to watch a program or a movie or play a game. Frees up surface space, giving your room a more sophisticated, uncluttered look. Protects family members and pets from potential TV tip-overs. Unfortunately, this hazard is more common due to the lighter yet more unstable design of new TVs. Allows you to incorporate your TV into a living room wall arrangement. If you plan to mount your TV above your fireplace, watch this video first to help you decide on the best TV mounts for your room. Leaning toward a particular type of TV mount? 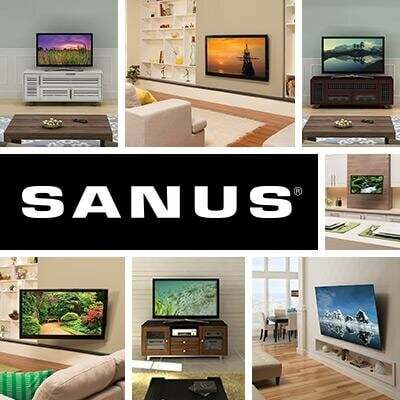 SANUS offers a variety of options. Check them out here.